Awarded author, Donald Young or Junior, as his family members called him, was born September 15th, 1963, to Donna Young. Junior’s biological father was said to be of Native American blood from one of the 6 Eastern Iroquois Nations, and some would even say his father was one of the Voda brothers, also with native blood lines. Donna's parents, Donald and Ethel Young adopted Junior, soon after his birth, because Donna was not able to care for him with her active life of travel. After all, it was the 60s, time of free love and war protests, and like most young adults of that era, Donna was an active participant, she was not one to settle down, or stay home on the family farm. Later on, Donna would give birth to four more children, two boys and two girls, all from different fathers. The older of those two girls, was shy and always hiding behind cat-eyed glasses till her mid-teens. Most said she was an ugly duckling, but the day she shed those glasses was the day she became a swan. The next oldest of the four, was a wild one like Junior, trying anything once, either to get a laugh or just to prove he could do it. The third, Grandfather's favorite, reminded him most of his daughter Donna when she was little and innocent. And finally the baby, last born, a Spitfire right out of the box, trouble with a capital T.
The city life was where the two youngest grew up in foster care, even though Grandma and Granddad tried to adopt them out of this foster environment, it never turned out that way, the city was in their blood and they had no interest in country life. Junior would get visits from his four siblings regularly when they came to the farm for birthdays, special occasions and holidays, Grandma Young insisted on this. Grandma was known to Junior as mom or ma, and Grandfather as dad but the other four children only knew them as grandma and granddad, this is the way it was even after all kids grew up. Donald young Junior would grow up on the grandparent’s 780-acre farm, and was raised as their own son and only boy child. Junior had a tremendous amount of freedom to explore the land and learn all natures’ wonders it had to offer. It was heavily wooded farmlands, located in North Central Wisconsin. The land was very diverse, and Don knew every inch, from the wooded hills to the dark deep swamps, and acres of rolling fields. Wandering over the land was his passion, as common to him as breathing. Juniors outdoor education started early in life with his granddad, who was an exceptional hunter, trapper, and fisherman, a true old world outdoorsman. Grandfather knew the tricks for outdoor survival, no matter what the season. Grandfather, Donald Sr. was Born before automobiles, when the horse and saddle or buggy were still standard transportation to all common folk. A hard worker and World War II veteran, he always made time for Junior and taught him to respect the natural outdoors. One of the Grandfather’s pastimes was to carve, he would sit under the old willow tree and carve beautiful wooden fishing lures, this craft he would only share with Junior. Grandmother was an old fashion Native Nebraska-born farm girl, and in her younger adult years was a real knockout, one who could have surely been a model. A miracle worker with nature’s medicinal gifts, she could treat and cure her animals or family when they fell sick. She knew her plants for food, wild herbs for medicine, and how to find, grow or harvest them. Grandmother always told Junior that he has a special gift, and someday he would understand it completely. All her spare time was spent teaching Junior the art of wild herbs, roots, and mushrooms used for cures. This was priceless knowledge that would follow him throughout his days, and even help save others. Visions and dreams that began early in juniors mind would continue occurring on a regular basis to influence his lifelong path. Don’s grandparents were amazed at how wildlife of all types reacted tame in his presence, often following him home to their farm. He had a magical way with wild animals, able to gain their trust and friendship, walking among them as though one of their own. Junior was wild at heart, free-spirited as any of the animals he spoke to or spent his time with. He was bonded for life to the outdoors, no matter what happened, setbacks or hard times, Don always returned to the forest, it was what he knew best, it was his calling. Things that happened early in Donald Young Junior's life would influence future events and would help him discover hidden mysteries in the natural world or spiritual realms all around him. He would make a name for himself as a wildlife specialists, guide, tracker of man or animal, healer and survivalist. His knowledge of herbal medicines and spirit work would gain him the powerful title, Verde Brujo healer among Latin Americans and Mide shaman to many in Native American circles. People and paranormal groups around the world would seek his knowledge of natural or spiritual matters to help solve their mysteries. As a tracker, Donald's abilities became legend to many in Cryptozoological societies for his ability to identify sign of known from unknown species. A lifetime spent in deep forests close to wild animals made his knowledge of habitation an asset to any expedition or hunters ready to hire. Although targeted by the media for his encounters and outdoor experiences, Donald was never a social person by heart and did not enjoy appearing on radio talk shows or television documentaries as some people thought. He preferred the quiet solitude of the deep forest, and the company of wild animals. 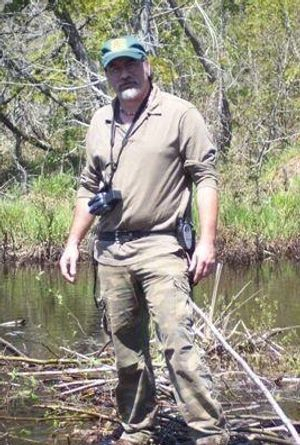 His participation in movies as a consultant or appearances in television documentaries was to him a way of broadening his and others insight about forest spirits or Cryptids. Even large-scale expeditions were not to his liking, but to him, that was also an educational opportunity for learning from other witness’s about their encounters or them from his. If you have encountered something strange in the forest, whether Cryptid or spirit, alien or just something you can’t explain. Come join a group that has members of the open minded, with informative conversations, interesting posts and an atmosphere of fun spliced with serious. 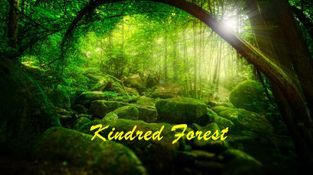 You will never be ridiculed or poked fun at in this family friendly group of the Kindred Forest.